Even within the distinctive island culture of the Tiwi people of Bathurst and Melville Islands, Kutuwulumi Purawarrumpatu's work stands apart. 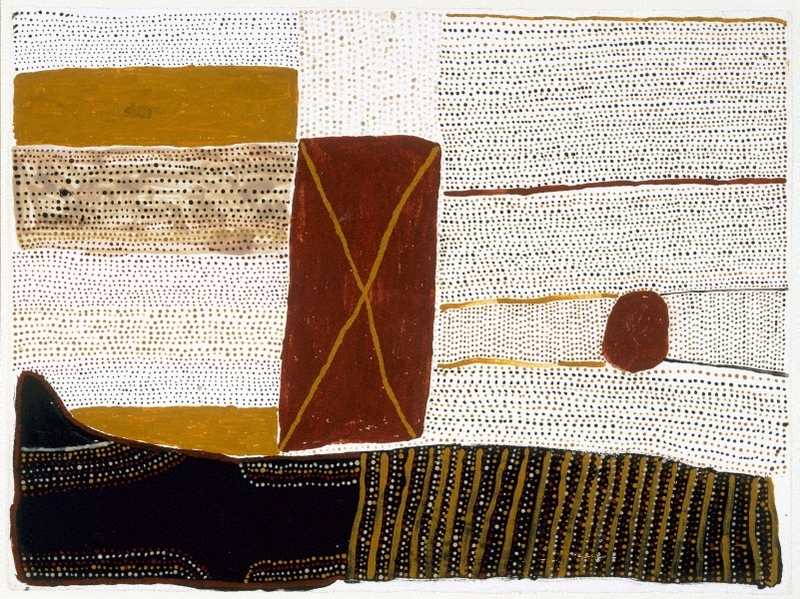 The Tiwi people share a visual language known as jilamara (design) based on innumerable configurations of mulypinyini pwanga (lines and dots). These designs are individually conceived and used as body markings in ceremonial performance, and also transcribed onto sculptures and paintings. A central tenet of Tiwi culture is the Pukumani funerary ceremony, which commemorates the death of the ancestor Purukuparli and celebrates the lives of those who have passed away. For this elaborate memorial to the deceased, monumental tutini (grave posts) are carved and decorated with natural ochres. At the culmination of the ceremony, after many of days of song and dance, the tutini are erected at the gravesite. Left to the elements, these solemn clusters of bloodwood sculptures stand as majestic sentinels to the endurance of Tiwi beliefs. Pukumani is the wellspring of contemporary Tiwi art, and its influence may be traced to the Indigenous mainland communities of Arnhem Land. Purawarrumpatu, commonly known as Kitty Kantilla, was a stalwart of Tiwi tradition, well-versed in the nuances of her culture. Her work is stamped with her imprimatur as a senior member of the community, yet also discloses a radical artistic spirit. Purawarrumpatu began working as an artist, outside of a ceremonial context, after moving from the mission on Bathurst Island to a widows' camp at Paru, in her mother's country on Melville Island. Here, she and other senior women formed the 'Paru Mob', carving distinctive, and usually figurative, sculptures. When working with ironwood became too strenuous, Purawarrumpatu turned to painting and etching for Jilamara Arts and Crafts. The Tiwi people established Jilamara Arts and Crafts at Milikapiti in 1989 to ensure the maintenance of their cultural heritage. Purawarrumpatu and fellow artist members, such as the late Taracarijimo Freda Warlapinni and Pedro Wonaeamirri, adhere to Jilamara's aesthetic standard of using a restricted palette of red, black, yellow and white ochre, thereby honouring the traditions of their ancestors. In her paintings, however, Purawarrumpatu often inverted the usual practice of painting on a black ground, instead executing fields of geometric designs and massed colour on a white surface. Purawarrumpatu's art embraces the conundrum of meaning and abstraction in enigmatic images that do not easily oblige literal translation. Refusing to be drawn into interpreting her work for an outside audience, she maintained that '... it's from the old times'. Hetti Perkins, Tradition today: Indigenous art in Australia , 'Kutuwulumi Purawarrumpatu', pg. 122, Sydney, 2004, 122 (colour illus.). Judith Ryan, Look , 'Kitty Kantilla: a Tiwi modernist from the bush', pg. 28-31, Sydney, Dec 2007-Jan 2008, front cover (colour illus. ), 9 (colour illus.). Ken Watson, Look , 'Pumpuni Jilamara (Good design)', pg. 24-25, Sydney, Apr 2002, 24 (colour illus.). Jonathan Cooper (Editor), Exhibitions events - Art Gallery of New South Wales , Sydney, Nov 1999-Jan 2000, 14 (colour illus. ).